What to Keep in Mind While Choosing a Truck Tool Box? 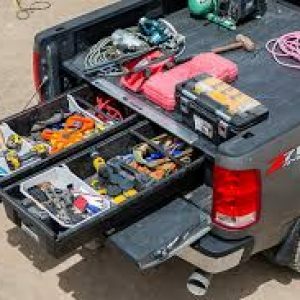 What Are the Advantages of Having a Truck Bed Storage? Many drivers adore pickups for their practicality and multifunctionality. However, it can be rather a big problem to store the tools for such a vehicle. If you store them in open boxes, you won’t avoid much rattle during driving. Moreover, the improper storage can be dangerous. Some drivers keep all the tools directly on the back seat. However, there is always a risk to damage your vehicle’s interior. Moreover, you won’t be able to transport your family or colleagues as much place will be occupied by instruments. The others prefer to store instruments in the truck bed. But such storage may spoil the instruments. Additionally, if the instruments are much exposed, there can be someone, you will be eager to steal them. The great idea is to acquire truck tool boxes. At first sight, you may think that it’s not rational to spend money on such a trifle. However, in reality, this box can be your great assistant. By storing all the instruments in one place, you won’t lose them or damage. Believe, it’s cheaper to buy a box than a number of new tools to replace the broken ones. Moreover, such boxes are able to serve for ages and help you to get rid of a number of problems with instrument storage and organization. As the selection of truck tool boxes isn’t very wide, the only things you need to keep in mind are the size, style, material and price. In order to make your life easier, we are ready to provide you with the tips on choosing the proper tool box. 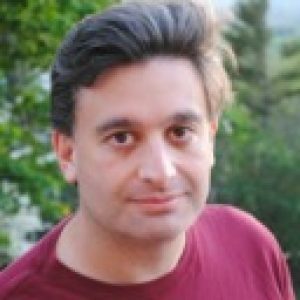 After reading this post, you will know what exact item you need to meet your requirements. This box of 71 inches is of premium quality and is considered to be the best choice for full-sized trucks. There is much space for storing things in this box and, simultaneously, it doesn’t aggravate the visibility of the rear window. We can’t say that this item is very cheap, but it definitely costs the money spent on it. 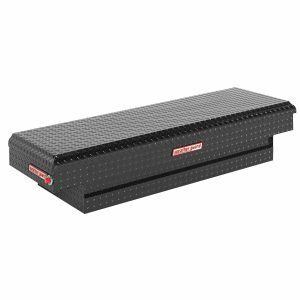 The WeatherGuard Low Profile tool box is a great investment of money, especially if you have many tools. As many tools are rather pricy, they need good protection and this product can surely provide it. Though, it stands behind WeatherGueard, it’s still a rational money investment. It features Brite-Tread diamond plated aluminum, full length piano hinge plus double gas struts. Besides, it keeps a handle with a lock, which will save your tools from robbers. Meanwhile, a strong covering will keep your instruments safe from harsh weather conditions. WeatherGuard turns out to be the best in this class as well. Its box for mid-sized trucks is of 61 inches. It’s made of thick high-quality aluminum and keeps secure locks. Though being a bit more expensive than its competitors, this product guarantees the safety of your tools and protects them from external factors. If you aren’t sure if this item costs the money it’s sold at, you can read reviews and opinions of people, who already own such boxes. 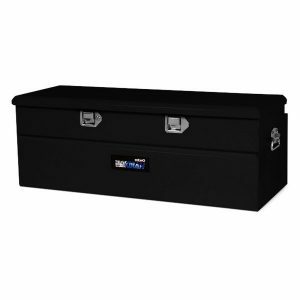 It seems that all the reviews are positive and no one regrets buying a WeatherGuard tool box. This item by Better Built is also trustworthy. The manufacturer gives you an opportunity to choose what material is better for you: aluminum or steel. If you want, the box can be covered with white or black powder. Additionally, you are free to acquire it in a deep tub style for keeping large instruments. Tool boxes are rarely made of stainless steel, which is known for its longevity. However, this Dee Zee box is just the case. The company utilized special black coating with NRT in order to save it from rusting. The additional hardness is provided by a crown style lid, featuring dual V stiffener. 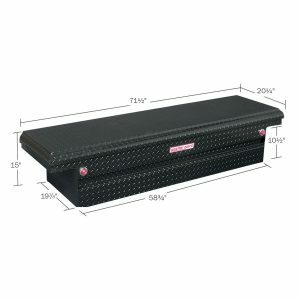 Besides, the tool box keeps self adjusting strikers, closed cell foam sealing, dampened gas shocks plus steel handles. The high-quality item features built-in carrying handles for easier lifting and a double wall lid for enhancing safety and ruggedness. 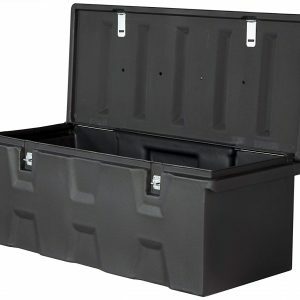 Having the capacity of 6.3 ft3, Poly tool box keeps a top opening lid with two zinc hasps. Moreover, this box won’t rust or dent thanks to being made of rotationally molded material. WeatherGuard appears on our list again thanks to its good quality side-mounted boxes, which are astonishing alternatives to crossover and chest boxes. These boxes give you an opportunity to access your instruments from the side of your pickup with almost no efforts. This box will cope with adding extra storage to the vehicle, which already keeps a crossover box. 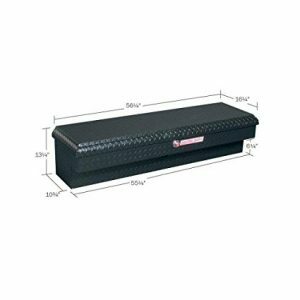 Just like other WeatherGuard tool boxes, this one is made of thick aluminum and is weatherproof plus it keeps secure locks. 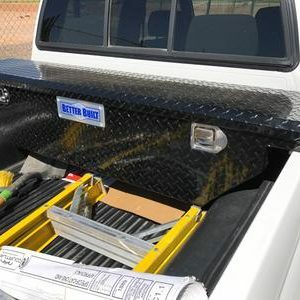 The side-mounted tool box by UWS is also a good option. Being made of high quality aluminum, it keeps pretty good welds and locks. Steel side mounts as well as aluminum ones include foamed lids, secure locks and rust-resistant stainless steel handles. Moreover, these tool boxes is the ideal choice if you need additional place for your tools, but still want everything to be stored compactly. If you are in the search of alternative solutions of storage problems, consider the DECKED storage system. Though it’s not exactly a truck tool box, it easily copes with the same tasks and definitely deserves attention. 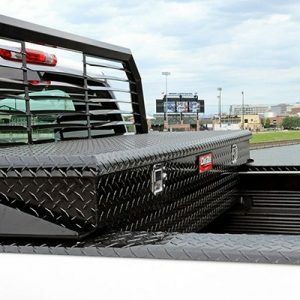 The DECKED is a custom fit, which can be installed directly in the bed of your truck. It’s supplied with multiple drawers for storing a great number of instruments. You can lift up to 2500 lbs on top of this system and, consequently, the bed’s versatility won’t be decreased. This item is a real godsend for fishers, hunters, bikers, skiers and other adventurous people. As we have already mentioned, this system comprises various drawers for storing the gear. These drawers are waterproof and will keep all the instruments safe no matter how harsh the weather conditions are. The drawers aren’t absolutely airproof and may let some mist or dust in. Additionally, you can get a lock for the drawers to save your instruments from burglars. The DECKED storage system is an American product, which is made from recycled High-Density Polyethylene mixed up with a steel subframe. The system is very enduring and is able to resist harsh weather conditions plus save your items from direct sunlight. Undoubtedly, before buying any tool box, it’s necessary to determine what exactly you need. Think about your requirements and needs beforehand. Moreover, you need to determine how much you can allow spending on this item. If you use the truck for work, you may want to invest in heavy duty items of superior quality and design. Be ready that such tool boxes may be more expensive than the ones of lower quality. However, if you already own expensive instruments, it’s better to provide them with good protection for over the years. Meanwhile, if you simply want to keep all your tools in one place, there is no need to pay much. You can surely buy cheaper tool boxes, especially if you don’t have too precious instruments. If you are eager to keep all the instruments safe and secure, opt for a toolbox, which can easily deal with that task. So, it’s advisable to select the items with strong latches, locks and strengthened lids. It’s great if the item keeps waterproofing characteristics. So, boxes with locks are better for keeping the tools safe from external factors and burglars. Stainless steel is probably the most durable choice. The main disadvantage of such boxes is that they are very heavy and it’s pretty hard to carry them. Aluminum tool boxes are also rather enduring and good quality. But sometimes, they can be flimsy and so, you need to handle them with care. Aluminum is resistant to rust. One more plus of such boxes is that they are lightweight. Plastic boxes can be pretty durable in case they are made of strong ABS plastic. Depending on the design, they may be weatherproof, very strong and lightweight. Basically, the material also depends on what you need these boxes for. All these three materials can be very durable, weatherproof and sturdy. Convenience is also important and you need to pay attention to how convenient the toolbox in use before acquiring it. Clearly, a box of any material, design and age will store your instruments. However, not all boxes are handy. It’s great if opening, closing and carrying causes no problems to you. Thus, a good tool box must be easy to open and close. If you use the instruments regularly, you need to face no difficulties with taking and placing them. So, don’t waste money on items, which open or close tightly and demand many efforts from your side. Additionally, the box must be easy to carry and transport. That’s why, the item must be rather lightweight and convenient to carry it. Simultaneously, it mustn’t overload your truck or cause damage to other objects in the bed. It’s also crucial that it fits your truck. Additionally, comfortable handles matter. When the handles are comfy, you will have no troubles with carrying the box. 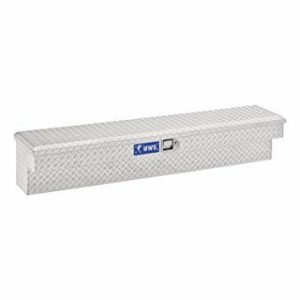 Truck tool boxes are utilized for storing your instruments as well as some other things. In case you doubt if you need a tool box or not, have a look at the following benefits to say “yes” to it. You know that good quality instruments are rather expensive. Water, extreme temperatures, direct sun rays may easily spoil your instrument. So, if you own some good tools, you need to provide them with enough protection to increase their lifespan and ensure their efficiency. Moreover, a goof tool box will protect your tools not only from harsh weather conditions but from robbers as well. It’s very convenient when all the tools are neatly organized and you know what their place is. The good organization may save your time and increase the efficiency of work (if you use them for that purpose). By acquiring a tool box, you will be sure that all your instruments are in one place and no item is lost. If you are a professional, take into account that you will make much better impression on your possible employers if you have all your tools beautifully organized in one box rather than scattered around the bed.